At Sourcentra, we have helped countless customers simplify the steps required to bring their products to market. 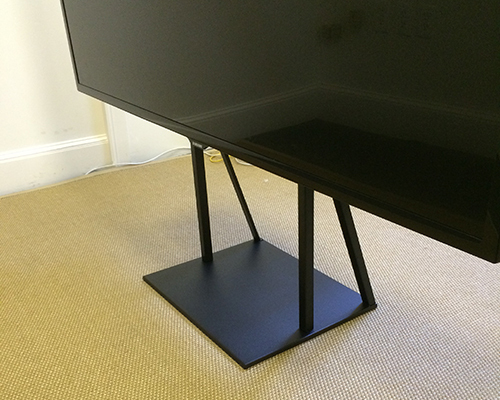 The Tuckaway TV Stand is a shining example of the benefits we offer our customers. The Tuckaway is designed to display your TV as if it were a piece of artwork. What’s truly unique is the way that it hides all of the associated cables, and allows the user to obtain the optimal viewing angle. It’s also designed to accommodate LCD, LED and Plasma Flat Screen TVs. This product is genius, and we are proud to announce that it’s made in the USA, right here in New England. This customer came to us for help because of our reputation as a single source solution for total product sourcing. In this case, we sourced all of the components to quality manufacturers that we have partnered. We fully vet every pre-approved manufacturing partner, which ensures that all of the parts and components are to spec and to budget. We also designed all of the packaging in-house, which was merged with the manufactured components at our facility. Fabricated, packaged, and ready-for-distribution and sales from our warehouse to end users and our network of retailers–we handled every aspect of the process. Sourcentra is a complete provider of branding services. Our solutions include: custom packaging, printing, design, global sourcing, engineering, prototyping and product production management.